Be it social, economic or national – the debate around the very definition of ‘Growth and Development’ is witnessing a paradigm shift. The approach of economies across the world, riding high on the bandwagon of ‘globalisation’, is becoming more ‘protectionist’. Concepts like ‘Human Capital’ have made way for more progressive parameters like ‘Human Development Index’. And last but not the least, one can witness a definite inclination towards ‘vocationalisation of education’ vis-à-vis ‘traditional academic practices’. Interestingly, these conversations are not simply evolving at a theoretical level but have a strong practical ground and ramifications too. In the context of India’s Skills ecosystem, for instance, the momentum towards skill training is being driven by the need for skilled and productive talent pool, the country’s bourgeoning youth bulge, the reformatory and industry-friendly policy makeup, the widening gap between employment and employability and the optimistic outlook of the global market towards India’s demographic dividend. All these and many other factors put together have shifted the focus towards vocational education. Today India is at the cusp of becoming a talent hub provided it can nurture the desired pool of skilled manpower aligned to the needs of the industry. What further strengthens the case for building a robust skills ecosystem is the addition of over 10 – 12 million people in the working age population per annum. It is a well-established fact that countries with higher and better levels of skills adjust more effectively to the challenges and opportunities of world of work. Historically, Westerns countries, for instance, adopted a progressive vocational system to address the demand and supply mismatch. The models designed by them had a qualitative approach towards the training, trainers and content. India can keep up with the growth of working-age population if it manages to create 10 million new jobs annually until 2030, which translates into approximately 27000 jobs every day for the next 12 years. As per ILO Indian Labour Migration Update 2018 points out – In India, the overall proportion of informal workers in total employment has remained relatively stable, at around 92 per cent. Coupled with a national unemployment rate of 3.4 per cent in 2017-18, the opportunities to find formal employment with decent wages and job security are restricted. As per UNESCO, the number of Indian international students enrolled in degree programs abroad doubled from 134,880 students in 2004 to 278,383 in 2017. Of the 800,000 engineers who have graduated in 2017 from technical institutions in the country, the All India Council for Technical Education (AICTE) found that more than 60 per cent remain unemployed. One of the main reason limiting growth is poor employment elasticity of our economy. As stated in the CII Report titled Future of Jobs in India: Enterprises and Livelihoods, Indian economy generates fewer jobs per unit of GDP growth than most other countries-at only two thirds of the global average. Therefore, India’s policymakers need to lay greater emphasis on the pattern of its economic growth, even more perhaps than the overall quantum of growth. The interplay of many forces creates the conditions required for more jobs. Technology is one of them. The regulatory framework of enterprises is another. The quality of entrepreneurship presents a third. Reach and relevance of vocational education fourth. An ecosystem of forces acting together produces jobs. Therefore, to change and improve the ability of the economy to generate more jobs, a systems view is required with an increased emphasis on vocationalisation of education. In the present-day context, industrial disruption is the new normal as the nature of Industry itself is in an ever-evolving state. Going further, the nature of change will extensively depend on the industry itself. Given the market dynamism, in addition to the job roles, the very nature of skill sets needed is witnessing a drastic shift. The Global media and entertainment or even Communications Sector, for that matter have already seen a great deal of change in the past five years. The financial services and investment sector, however, are also being radically transformed with nationwide reforms. Those working in sales and manufacturing are in need of new skills, such as technological literacy. The historical evidence suggests that while technological advances create disruption and significant short-term labour displacement, in the long run it creates a multitude of new jobs and unleashes demand for existing ones, more than offsetting the number of jobs it destroys even as it raises labour productivity. 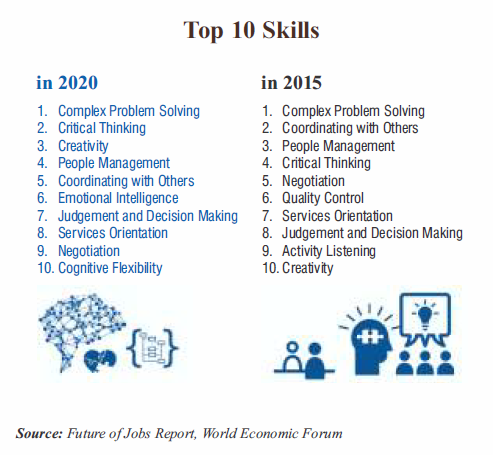 The change is inevitable, and it is pertinent for business leaders, educators and governments to adopt an aggressive approach towards aligning the vocational skills ecosystem with the changing industry needs while laying emphasis on up-skilling, re-skilling and retraining people. Countries like Switzerland, Germany and Singapore are successful examples of how vocational education can help shape economies in a progressive manner. Almost 65 per cent of secondary students opt for vocational programs in Switzerland and Singapore and over 48 per cent students in Germany. This acts as a huge contributing factor to the employment numbers – 93.3 per cent in Singapore, 90.4 per cent in Switzerland and 90.1 per cent in Germany in the age group 15-29 are already employed but in India the average rests at 30 per cent. Vocational education in India is currently imparted by more than 13,000 Industrial Training Institutes (ITIs) – post-secondary institutes constituted under the Directorate General of Training (DGT), Ministry of Skill Development and Entrepreneurship (MSDE), which cater to about 36 per cent of the people enrolled in various training programmes in India. The figures stated above reiterate the importance of vocational education to meet the mounting jobs challenge and push the youth towards a productive ecosystem. Government acknowledges the criticality of giving vocational education the desired impetus. As per the Union Budget 2017-18, Government of India has allocated around Rs 17000 crore to help in advancement of employment generation, skill development and expansion of Skill India Mission. The World Bank approved the funding of US$125 million which aims to improve the quality of vocational education at various ITIs. India has also partnered with Germany to sign an agreement with a budget of US$3.37 million to help and improve vocational training and skill development in India. Germany has partnered in an initiative with India to create 500 million skilled workers by 2022. Trained manpower is the backbone of industrial productivity, which not only translates into qualitatively superior products and services but also leads to enhanced efficiency, thereby making organisations increasingly competitive. While the academic input plays a critical role, in the current times, when the dialogue is shifting from degree-based qualification to skill-based accreditation, skilling has taken centre stage. Given the background, it is important for industry to support vocational education by defining the skill requirement, help in reviewing the existing curriculum, conduct training of trainers, adopt ITIs, encourage Apprenticeship and support on-the-job course component. Any amount of skilling is beneficial only if it is relevant and an active role by the industry can be a game changer in this regard. The market dynamism has led to a huge change in consumer behaviour, use of technology, design of products and the desired skill sets. Today, India needs to nurture its talent pool with a view to serve future jobs – which are in an evolutionary state. While there is no denying that one needs to deal with complex challenges on the talent supply front – the receptiveness and engagement driven by the demand side i.e. industry seems promising. Progressive changes being made to the skills ecosystem with a definite push towards vocationalisation further strengthens optimism. 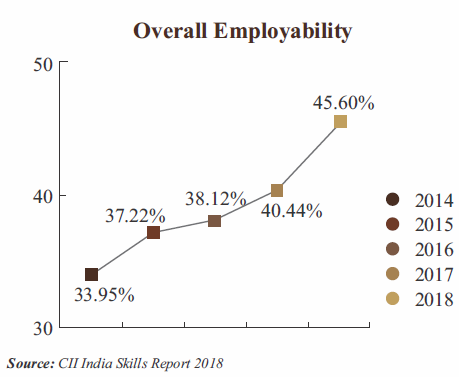 The CII India Skills Report 2018 states that 45.60 per cent of students are employable or are ready to take-up jobs. Overall employability has risen from 40.44 per cent to 45.60 per cent over last year. And in the last five years, overall employability has gone up from 34 per cent to more than 45 per cent resulting in providing more employable resource to the economy. The momentum has been created but what is challenging is its sustenance. As employability of Indian workforce improves, there is a need to explore local and global job markets, give a push to entrepreneurship, simplify the micro-finance ecosystem, continuously ramp-up the academic input and encourage access and awareness about vocational programs. Adaption to technology and relevance to industry are key to prevent the demographic bubble and turn it into an economically viable opportunity for India.